I´m "the other", the other one who looks like me, the one who negotiates a similarity all the time. Video editing by: Ayelen Ruscica (with Edouard Vallée´s collaboration). While I was in New York in 2002, I saw a advertising poster of a partly ripped face. Behind that, another nose and eye emerged to the surface creating a new intriguing face. Since that I’ve been looking for and creating different possibilities to develop the idea. The basic concept of this action is the same as the one seen in my other work, Reflections. I want to explore different visual ways to carry out this concept. With this work I wanted to delve into the idea of mixing two images: a stereotypical image of how a woman is supposed to look and the real one, the image of myself. The two faces blend and generate a new different face, as a methaphor of my idea. The formal element I’ve based my work on is the moment in which I rip the paper. 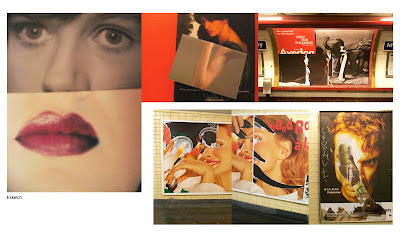 The action of tearing the poster, the images formed by broken parts of papers and also the editing of the different takes reinforce the concept too. I “break” the music overdubbing it with the sound of tearing papers and I cut the image (leaving a black screen with sound in the background). In her webpage: www.pilaralbarracin.com you can see some of her Works. The ones I’m most interested in are: I will dance on Your Grave 2004. Musical Dancing Spanish Dolls 2001 and Long live Spanish 2004. I’ve chosen these works for their sense of humor and the freshness with which she questions gender roles and the clichés of the Spanish identity. I was specially inspired by the video I will dance on Your Grave; dancing as a festive fight between identity and the role we’re supposed to play. Location: in the private space where the Internet use ris, probably his living-room or even an Internet café. Wherever there is an internet connection. It is an attitude that takes the internet user to his/her own physical space. I’d also be in social networks. Time: 4 minutes 50 seconds. The Basic idea is the building of identity (related to some of my previous works. See Background). I’m interested in the way we shape our own identity as a reflection of the social group we want to belong to. At first this can be sheltering, a connection that can create a conflict with the individual when the (unwritten) rules end up hiding part of that person’s features. I’m interested in our need to belong to a certain group, the need to be a member of society. It’s always been enthralling for me to see how we mimic outfits, attitudes, expressions, hairdos and even the morphology of our body.. But the things we like about that “merging” can be oppressive at the same time, it can become suffocating and it can lead to a search for the difference. For me, that’s a characteristic feeling of my generation; a fragmented and deconstructionist generation. In the global village we live in there are multiple behaviour choices that sometimes are antagonist. This variety invites individuals to reinforce the things they have in common with others like ideas, feelings, leisure activities…etc. But sometimes those common interests are not enough to make people “connect”. We “sell” ourselves in social networks such as Facebook, Blogs, MySpace…, as a perfect “product” to fit in a group of people. It’s a reflection, an alter ego of what we would like to be. A space to be popular with an image based language (digitally modified pictures, short and witty quotes and music) that tries to represent a lifestyle. Once offline, the individual goes back to its anonymous nature confused about who he is and who he pretends to be. I wanted to create a music video look as an ironic reference to those fast and trimmed images of our (over) Affluent society. a real action because it’s not a single live performance but 50 different takes cropped and put together. The brightness and color of the images were digitally edited (the real image as it is doesn’t seem so intense) and I didn’t see myself reflected. I imagined my reflection as others would see me and I move according to how I think I’m going to be perceived. Like in social networks, I show myself the way I think they are going to see me. During the course I was specially interested in two aspects: the letter system as a tool to analyze the building of a performance and experiencing with body in a certain space. I wanted to use both of them to develop this work. In this process I started to think not only in how the body moves in space but also in body movements and facial expressions. Before that I had barely worked with the expressiveness of my body and it has been a big challenge for me to learn to pay attention to positions, rhythm, facial expressions, muscles, and the lines I drew in the air with my arms and legs. With this work I’ve become aware that, the way we stand in a certain space, and the way we move it’s part of how we build our identity, it’s like a live performance that expresses and idea as much as words do and that gets its meaning out of repetition. I will develop this idea in my next piece of work that consists of a series of photographs or videos of Motus. French people develop a very characteristic musculature around the mouth and, when it’s relaxed it has like an “u” shape. People from the United States have a very characteristic smile, very friendly but also very similar from one individual to other.